Heiden was from our Olympic Gold Litter. 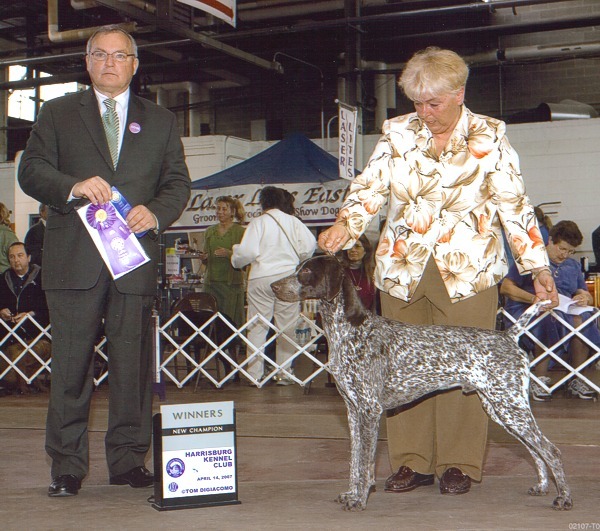 He was shown to his championship by Patty Crowley and garnered several awards at the 2007 GSPCA NSS in Kentucky as a youngster. except for the UPS delivery guy. Our deepest condolences to Jim and Paula Dougherty and our sincere gratitude for the wonderful, loving home he was given for all these years; still never long enough. The heartache is incredibly painful and right now there just aren’t words to lessen the grief. clear blue ponds for swimming. Rest well sweet boy until mom and dad come to be with you again one day. Owned and deeply loved by Jim & Paula Dougherty. Proudly bred by Shomberg.